Cave Creek windshield replacement and auto glass repairs are professional, easy, and guaranteed with Glas Tek. Glas Tek is a Cave Creek windshield replacement and auto glass repair company that prides themselves on their world-class customer service and the absolute best value. We serve all customers with unsurpassed high quality windshield replacements and yes we even come to you, the residents of Cave Creek Arizona. We serve all over the valley every single day, and we have some of the most skilled auto glass repair and replacement technicians out there, who have at least five years in the business of auto glass replacement and windshield repair.We offer free mobile auto glass repair to Cave Creek residents, car windshield replacement prices online, INSTANT $50 CASH w/ insurance windshield replacement claims, free windshield chip repairs w/ any new glass purchase. So who are you going to trust with your safety, in a rollover accident the windshield is about the only thing that is keeping you protected from the roof coming in. So just remember safety comes first, and when it comes to safety, value, and service your best bet is Glas Tek. Glas Tek makes it easy to have a Cave Creek windshield replacement or auto glass repair. We offer free Cave Creek auto glass repair quotes online, $50 Instant Cash with all insurance windshield replacement claims, and we come to Cave Creek residents free of charge. We are a preferred Cave Creek windshield replacement shop for all major insurance companies including: Farm Bureau, MetLife, Nationwide, Safeco, Safe Auto and Geico. Our nationwide lifetime guarantee is backed by all major insurance companies to put our customers at ease. Furthermore, the $50 Cash Back incentive will be paid at the time of service. We accept all insurance pricing so that you never have to worry about being billed for any additional services. In addition, we come to businesses and residents of Cave Creek, Arizona. Cave Creek is one of Arizona’s most unique cities it has to offer, and the reason because it’s the only city in Arizona that has completely kept it’s western flair. It’s not often at all to find a town like Cave Creek. Not so many cities can keep there old western roots and character when giant cities like Scottsdale and Phoenix which are so close and are always rapidly growing. Cave Creek was originally established as a stopping point for the U.S. Calvary in the 1870’s, it’s most definitely not like any other towns now that is for sure. Now most of the buildings built in the 1800’s are gone, but the ones that aren’t gone are all reminiscent of what things looked liked in the old Wild West which was so long ago which can really bring out some flavor in a city. It’s location is high above Phoenix in the foothills of Black Mountain, Elephant Butte, and Skull Mesa. Cave Creek has accomplished something incredible, actually maintaining it’s charm and old west style after all the expansion and growth within the metropolitan Phoenix area. Cave Creek is one of the most noticed Western towns in all of the United States it features many western style events and places. It features a handful of saloons, several Rodeo Events, western shops and lots of live western music. 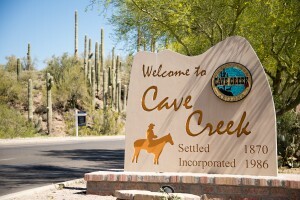 It also carries many specialty stores and many other places that make Cave Creek definitely unique and treasured.